BrightSign has extended its recently launched Series 3 player family with the addition of its first player to support the Intel Open Pluggable Specification (OPS). BrightSign created the HO523 to support the growing number of digital signage installers implementing OPS-based solutions. The HO523 is based on BrightSign’s Series 3 HD player and features a JAE TX25 plug for connecting to interior display components (video, USB, serial, etc.) The outside edge has industry-standard connectors, as well as specialized device control and feedback interfaces. More than 2 million displays with an OPS slot have been sold thus far worldwide. Of the seven manufacturers that offer commercial-grade displays with OPS, NEC is leading in production with almost half of the total OPS display sales worldwide. The HO523 can be seen at Integrated Systems Europe (ISE) in Amsterdam, February 7-10, 2017, on BrightSign’s stand, 8-K240, the Elo stand, 10-N148, and the NEC Display Solutions stand, 5-R24. The HO523’s feature set is similar to the BrightSign HD3 players, and benefits from the many technology updates included in BrightSign’s Series 3 media players. These include an M.2 interface for an optional Wi-Fi antenna or a solid-state drive (M.2 SSD), gigabit networking, and Mosaic Mode. The HO523 delivers a hardware-accelerated HTML5 engine, 1080p60 video decoding, robust interactive controls, and dynamic live content features. With the addition of the HO523, BrightSign’s portfolio of digital signage media players is now comprised of eight players spanning four product lines. At the entry level, the LS423 is a fully featured, commercial-grade player offering an alternative to consumer devices often chosen for price-sensitive digital signage installations. The HD223 and HD1023 add a hardware-accelerated HTML5 engine and 1080p60 decode, along with BrightSign’s media-handling platform. The two new XD players offer 4K support and can decode either two 1080p60 videos or a single 4K video and a single 1080p60 video simultaneously. 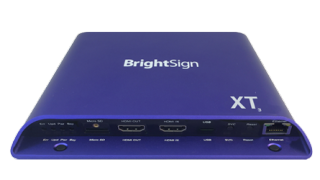 The top-of-the-line BrightSign XT players offer the highest performance with the company’s fastest HTML and graphics engine and the most powerful CPU. This technology for enterprise-level digital signage installations supports dual video decode of one 4K and one 1080p60 video simultaneously, HDMI input for live TV pass-through, PoE+, and advanced HTML5 applications and interactive options such as gesture/swipe, WebGL, and more.